Just a quarter mile from the Atlantic Ocean, Valentin Marieta features 128 private apartments with a living room and kitchenette. 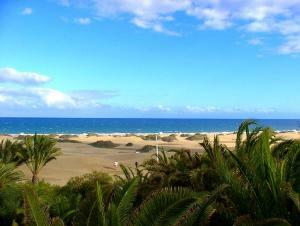 Each one has a balcony with impressive views of the sea or the beautiful island landscape. The Valentin Marieta complex has a rooftop terrace with a panoramic view. You can relax by the outdoor swimming pool with a cool drink and small snack from the poolside bar. The complex features a children's pool, a playground and an entertainment program including sports and a nightclub. There is also a pool table and a 2-meter satellite TV in the bar, and the hotel organizes volleyball and other outdoor activities. Under 2 miles away, you will find the lagoon and fine white sands of the wonderful dunes of Maspalomas. The Aparthotel is just a few yards from the center of Playa de Ingles, which can be calm and peaceful or vibrant and exciting in equal measure, day or nightlife. The Playa del Ingles with its magnificent beach of 3,281 yards is predominantly a tourist region, so you can rest assured that you will find all the amenities and activities you need for a memorable stay. Please note that guests are required to wear long pants in the restaurant.